Below are all of the Amazon reviews for the 1st edition of Free is Beautiful: Why Catholics should be libertarian. I’m re-reading my second copy of Free is Beautiful. I gave the last one to a friend. I will be buying several more copies for friends and family over the next few months. Mr. England is a man out of another time. He thinks and writes in a refined and graceful manner very rare in our dissonant age. In another time he would be well known and sought after for his wisdom… In our age, where sarcasm is a synonym for irony, people like Randy England may be happier to be mostly ignored by the “great and powerful.” I a way though that’s a good thing for those of us who can still appreciate, respect and in my case maybe envy a teensy bit, true refinement. This book addresses questions that a Catholic libertarian might ask himself or herself. Some questions, such as abortion, might require further introspection, but this book goes far to ease that apparent internal conflict that some individuals might encounter. More importantly, it can be an effective tool for Catholic libertarians to advocate ideas of liberty within our communities. As a 22 year old Roman Catholic, and Political Science/History Major, I’ve been waiting for this book a long time. Catholic Libertarians such as Thomas Woods and Lew Rockwell have some new intellectual company in the person of Mr. England. The book is a concise, effective defense of the marriage between Voluntarism and Morality. This work centers (as it should) on the Non-Aggression Principle, something we all innately adhere to, and live by in our personal lives already. Only the State claims the monopoly right to “legitimized initiation of the use of violent force.” Mr. England’s book lays out a reasoned, and well supported (by scripture, tradition, and magisterial teaching) exposition of why and how the state’s aggression in all realms of our lives: Economic, Social, etc. is both immoral and impractical. He covers state monopolistic aggression in the market, social welfare, law courts, police service, national defense, etc. and possible Voluntaryist solutions in those areas. Mr. England also deal carefully and thoroughly with the myth that libertarianism and the pro-choice stance and inextricably linked. The book is a success, and a must read for all Catholics. “Free is Beautiful” just jumped to the top of my list of favorite books, tying “Rediscover Catholicism” by Matthew Kelly. Jesus’s admonition to “Give unto Caesar what is Caesar’s and God What is God’s” challenged us to define what was owed to each. Mr. England’s response is to give Caesar Libertarians and let the Catholic seek God in their own way. There is an almost knee-jerk rejection of Libertarianism by Catholics, which I think may stem from some Libertarians wishing to be free of all constraints, even the natural law and orthodox moral guidelines. England’s discussion of “Non-aggression” restraint on all relationships informs us of the basis of most Libertarian thought. While the book is new, and Libertarian theories of government are relatively modern, the issues stem from Samuel’s warning to the Hebrews about having a King, through religious history to Jesus, to doctors of the Church. I find it encouraging that one of marks of Pope Francis I’s biography is his participation in personally aiding the poor, because this is the natural and necessary results of Libertarian government in a merciful world. Much of this book discusses the various functions of government, how well govt. does and how free-will, free enterprise solutions might compete and exceed the performance of government. Consider a world without govt monopolies on education, police, fire, courts, banks, attorneys, etc. Highly recommended! Libertarian because I’m Catholic. Great refutation of the Rothbard/Block view of abortion and the notion of the unborn baby as “trespasser.” Quick read. No mention of the Great Expropriator otherwise known as the Federal Reserve. Maybe the next edition. Excellent book which clearly explains how Catholicism and libertarian thought may coexist. I read it in one day and had a hard time putting it down. Very well organized book. Pages and pages at the end of all the sources sited. Very informational, easy to read and interesting. I’ve recommended it to many people. My husband and I enjoyed reading it together and look forward to reading it again to try to commit some of this rich information to memory. This is an absolutely essential read for any Christian who is interested in liberty. A friend (who is a priest) of ours was visiting from Michigan while traveling to the Texas. He saw the book and chuckled because of his of views of libertarians. These views were the standard government school and Republican party stories. He jokingly opened up the book and expected to read a wacky passage that would confirm his views. It was heartening to see his face as he read passage after passage and nodded in agreement. I gave him the book and ordered another for my family and other friends. Mr. England has written a winner! Well-written and well argued. Highly recommended even for non-Catholics. The final nail in the coffin of identifying myself as a conservative was reading this book. Mr. England makes a very persuasive for dismantling the Nanny/Neocon state. His arguments for Catholics impressed even an old Protestant like me. I am sure some of those who are in favor of the guns/butter government we have now will take issue but we’ve tried it their way for the last 84 years and now it’s time to go back to when people were responsible for themselves. This goes good with Little House on the Prairie reruns also. First off, I agree with Kurt, a dedication page would have been nice. This book is clearly written and gives me something new to think about every time I read it. For a long time I have been searching for something to put into words what I’ve felt in my heart and this book does it. There is a widespread belief that Christians, specifically traditional Catholics, could not possibly be Libertarians. Randy England demonstrates the error of that belief in clear and concise discourse. Beginning with the basis of Libertarianism, the non-aggression principal, Mr. England illustrates by argument and Catholic apology Libertarianism’s congruence with Catholicism. Freedom, God’s second great gift after life itself, is the core of both Traditional Catholicism and Libertarianism. Mr. England’s treatise explores the details of political Libertarianism and Catholic teachings in the contexts of dogma, property, the Right to Life and the criminal law in it’s first part (five chapters). Citing Aquinas, St. Paul, Augustine, C.S. Lewis and even Bilbo Baggins (among others); and drawing from sources from the Old Testament to the New Catechism, Mr. England lays the basis for the inevitability of religious Catholics final embrace of the freedom of Libertarianism. While already a Libertarian, it was a comfort to be provided with the facts to support what I understood implicitly – that freely chosen religious belief spoils one for enforced constraint in areas outside the spiritual. Part II of Mr. England’s book is more practical and addresses the everyday issues of today’s regulatory State. Those familiar with F. A. Hayek’s The Road to Serfdom understand the themes of economic control and the totalitarianism of collectivism as Mr. England discusses them. Free is Beautiful modernizes these themes for the 21st Century with its references to Homeland security, counterproductive licensing and economic strangulation by Byzantine regulatory schemes. It you have ever suspected that the “powers that be” actually are prohibiting everything free, fun and profitable (except for them), the proof of it is within the pages of this book. Unwilling to just complain, Mr. England proposes both recognized Libertarian solutions for the “dangers” allegedly addressed by the strait jacket of Statist regulation and also his own novel transitional practices to shift from the status quo to a real Libertarian society. If there is any weakness in the book it is here where the author takes the leap from diagnosis to treatment. Regardless of any criticism of the particular tactics offered by Mr. England, it is refreshing to see an author with the courage to propose any path out of the peonage of modern American progressive Statism. I am a libertarian Catholic writer, and I have to say that this book stands up with the best of them. 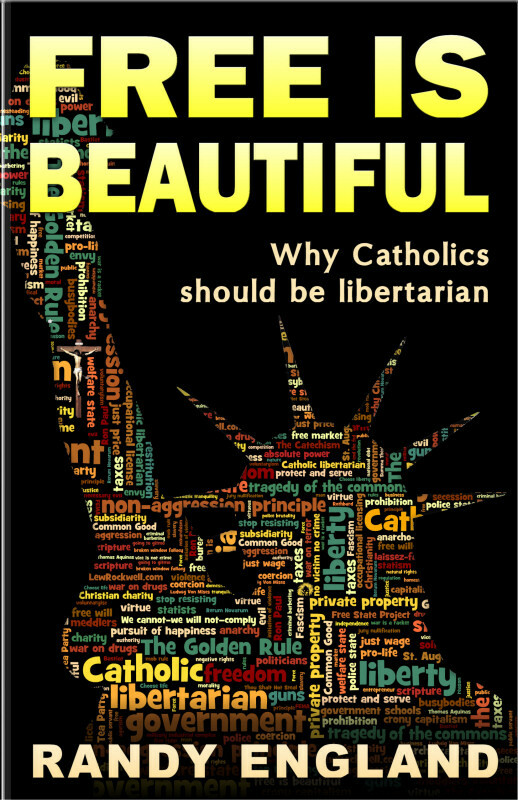 I’ve read Tom Woods, I’ve read Napolitano, but none of those do what this book does so well: explain exactly why every Catholic not only should be libertarian, but actually HAS to be libertarian (that is, if they believe in what the Catholic church teaches). Potentially controversial, but very well researched and sourced, this book pulls from all sorts of places, including papal encyclicals and teaching of Aquinas, Augustine, and other saints. This is a must read for any politically active Catholic. Mr. England has obviously done his research and his arguments are well supported. His writing is creative, yet his thoughts are easy for the novice political reader to understand. Now for my questions. I couldn’t help but notice there was no “dedication” page. Didn’t he bounce his ideas off of anyone? I can’t help but think there must have been someone who inspired him. Perhaps a couple of someones, like maybe a certain two someones that he eats lunch with on a weekly basis. And maybe those someones thought they might be worthy of mention on a dedication page. Hey but who am I to say who Mr. England thinks is dedication worthy or not worthy? Even if those someones weren’t “dedication worthy” he still could have used their first names in the examples in his book. Not like those names are hard to spell or anything. They would have brought a little diversity to the book. Bet if he had used a dog in his examples he wouldn’t have named the dog Spot or Rover or some name like that. Just sayin. Of course Catholics should be libertarian. It is easy to say this after reading Mr. England’s book. While I had libertarian leanings before, I was caught up in the idea that morality, whether fiscal or social, is the government’s job to legislate. This is all good and well until it is a morality that differs from mine that is being enforced. In all the disagreement between Democrats and Republicans, conservatives and liberals, neither seems to acknowledge that they are both campaigning for the same thing, a government that takes THEIR side in things. Ultimately, just as God does not drag us kicking and screaming into discipleship, one should not expect a government that does so, either. Except for crimes which have a clear victim, England makes just this case. Toward the end of the book he engages in some libertarian thought experiments, some of which I could not find myself agreeing with, but he does an excellent job of fleshing them out. However, the bulk of the book is especially clear on many of the issues that voters face regularly, including the hot-button topic of abortion. Despite what Libertarian (capital “L”) talk show hosts may claim, pro-life it truly the libertarian position, and England does an excellent job of making this case, including arguments I had never considered before. This is the greatest political philosophy book I have ever read. It is based solidly in Church Tradition and political history. It is simply written and easily understood while being ingenious and profound. 16% of the kindle addition is just footnotes, he’s not just giving his own opinion. I could not more highly recommend this book. This book is based in many ways on the same deception the author uses in its description. Randy England states that the Golden Rule is “Don’t do unto others what you wouldn’t what done to you”, thus misquoting it for his own purposes; in reality, it says “DO unto others…”, which is a very different thing. Rather than ‘Do not hurt others’, the Golden Rule is to actively help others. Now, as if happens, there are far too many people in this world suffering from poverty and hunger for individuals to be able to care for… perhaps the very wealthiest citizens could make a difference, but most of the rich didn’t get that way by giving their money away. There’s not much more the Church can do– most parishes can barely afford to fix the roof and the furnace in the same year, let alone challenge poverty or hunger in a serious way. So who does that live to assist those in such dire need of help? Libertarianism doesn’t seem to answer that question very well. If we are going to argue from the Golden Rule, then let the question must be asked, “If you lost your job and had your house foreclosed on, your spouse died and you had four kids who were hungry, then would you like the government to give you a hand?” And if so, should you ‘do unto others as you would have done unto you’? Remember, we ARE the government– it is we who vote for who make the decisions, even if too few of us bother to vote. Have you ever wondered why there seem to be no poor Libertarians? It’s probably because those who have very little recognize that Libertarianism only benefits those who are at least moderately wealthy. The Golden Rule which the author abuses exists in some form in almost every world religion– no faith teaches us to put ourselves first. Christianity’s roots are abundantly clear on this topic, for example. When Israel was a still a theocracy, the poor, the widowed and the alien were cared for, because it was God’s will. I have a pretty good idea of what the Old Testament prophets (and our Lord) would have to say about Ayn Rand and about this writer… and it wouldn’t be either ‘Buy these books’ or ‘Buy into this selfish and materialistic philosophy’!